A hundred years ago, this is how farming looked. 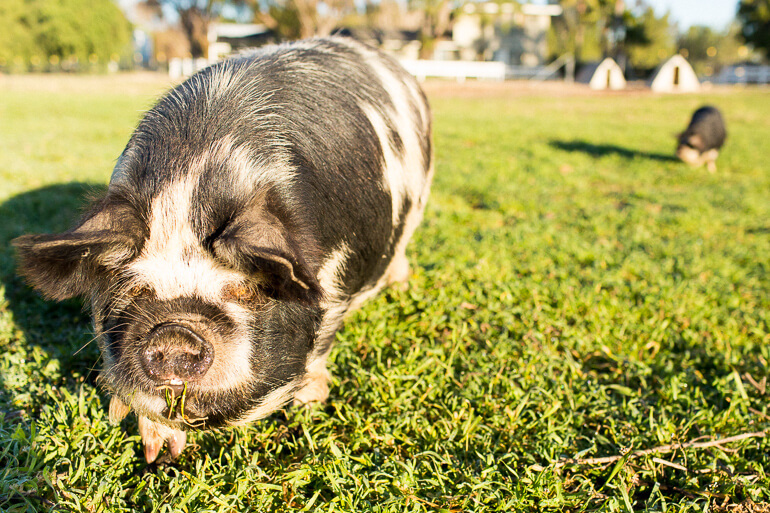 Ruminants such as cows, goats, and sheep graze on a section of pasture, followed by chickens and then even pigs. 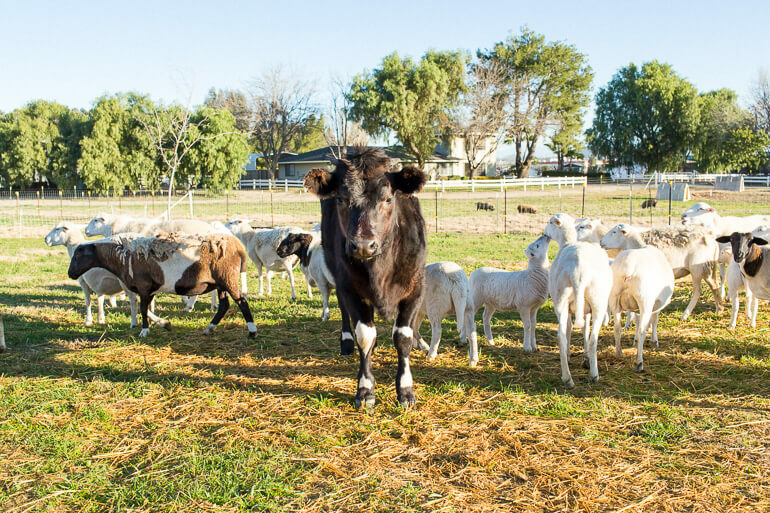 This process of livestock rotation with appropriated space helps to naturally suppress diseases and parasites in the animals, and provides a diverse range of fertilizers for the land to replenish itself. 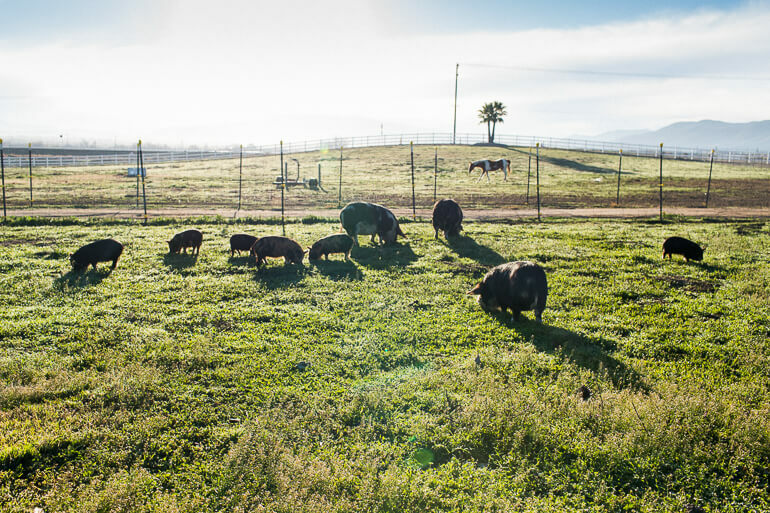 At Heirloom, it has always been our quest to know where all of our ingredients come from. 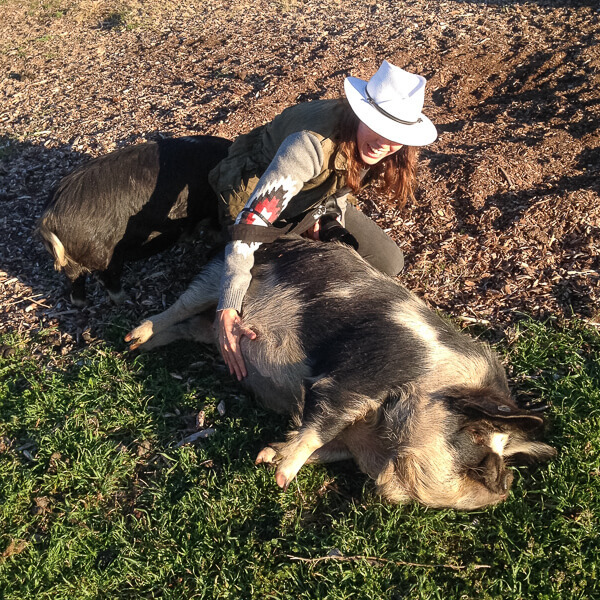 Sourcing local meat in the quantities we need that is raised with respect for the animal, the workers, and the environment has become our biggest challenge. Just drive up the 5 Freeway from LA to San Francisco, and you will see and smell that our state is dominated by big industry farming where thousands of cattle are jam packed together in horrific, inconceivable conditions, with their waste being run off into dead zones of our ocean. That’s what cheap meat is, and we want no part of it. 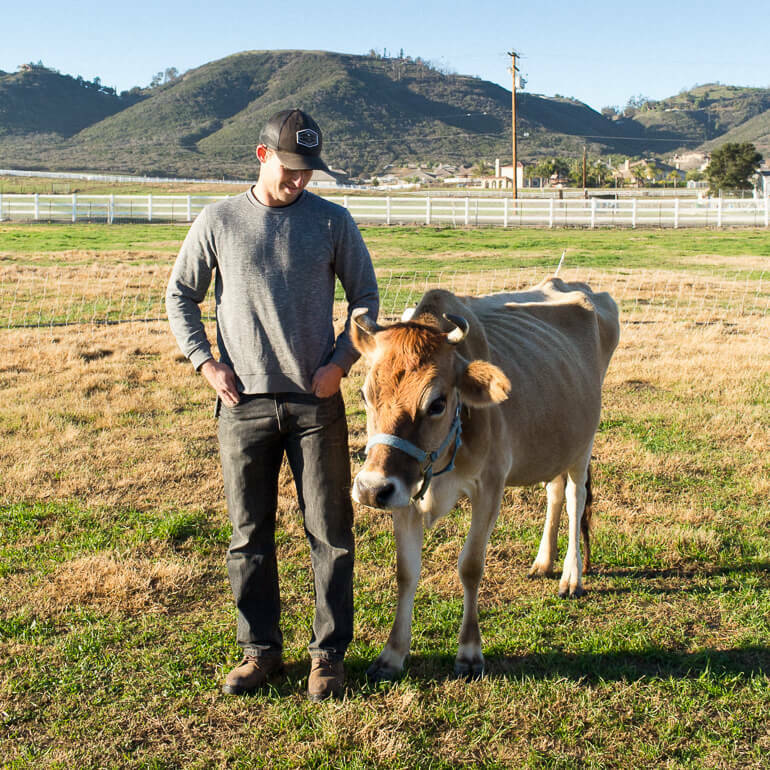 When we heard a small farm in Murrieta called Primal Pastures was looking to start selling wholesale, we immediately arranged for a visit to learn more. 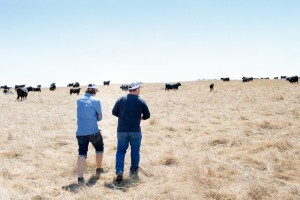 Pictured here is Farmer Paul who, with his brother, started farming three years ago after he suffered from extreme allergies and became aware that eating more nutritionally dense food (like 100 % grass fed meat) would alleviate his symptoms. 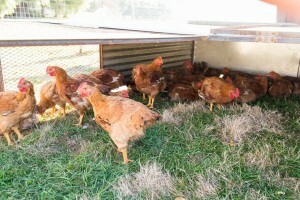 On a whim, he bought a bunch of chickens and advertised on Facebook that they would be for sale once he fattened them up. He sold all of them within minutes and Primal Pastures was born. Their meat is now available for retail online ordering. 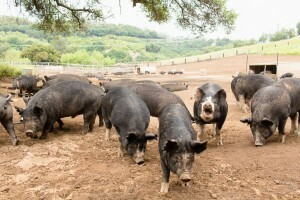 If you eat meat and live in California, be sure to check them out! 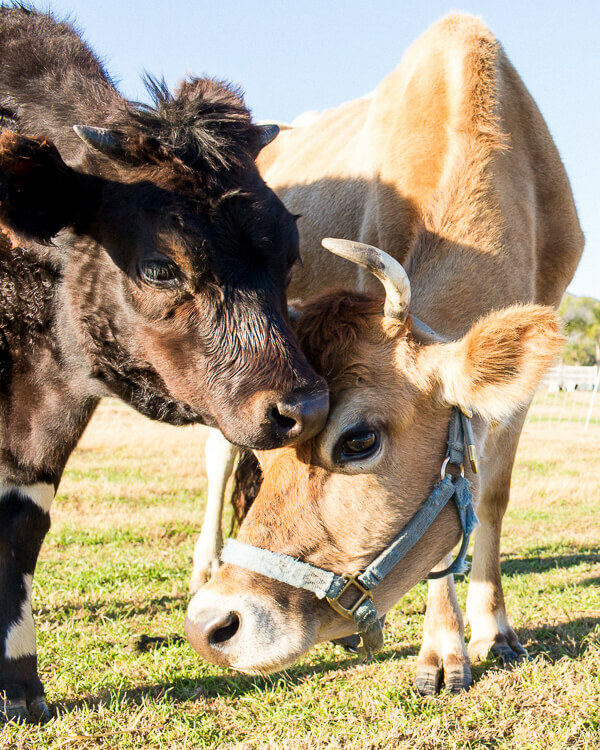 Mabel, the Jersey Cow on the left, is the mother of Fred on the right who is 8 months old and still nurses from her. This action, which is never, ever found in big agriculture, creates an unmistakably loving bond and works to fatten him up more naturally. 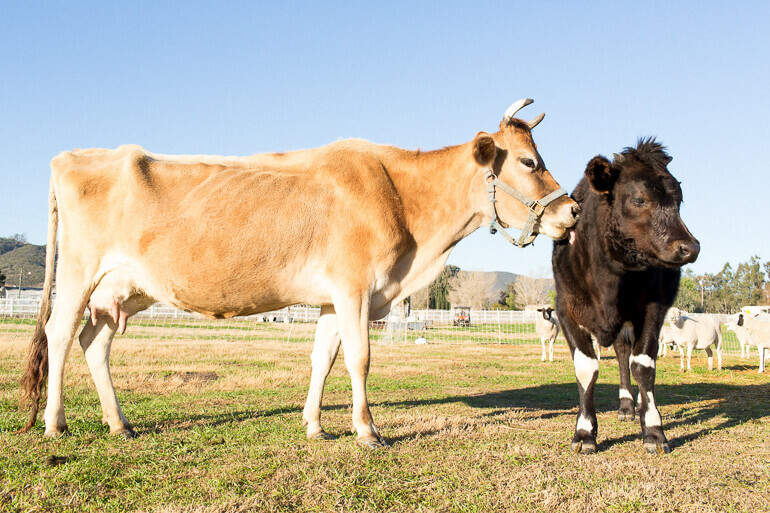 Farmer Paul was hoping for another female, to get a dairy program started, so Fred will continue to nurse and forage on grass for another year and a half before he is market size. 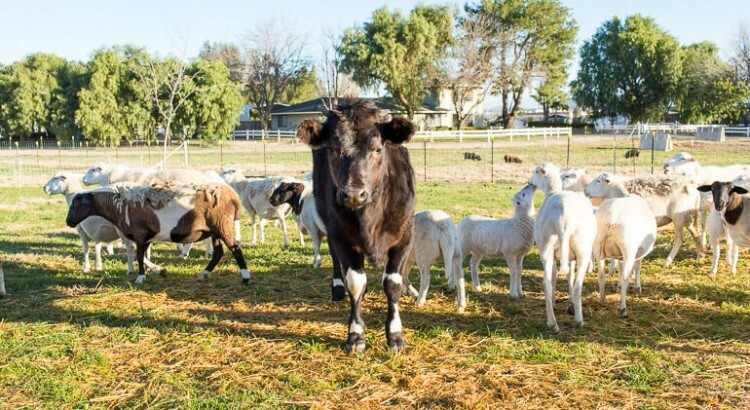 Animal lovers who are moved by these sweet photos, please understand that this is the optimal scenario for beef on your plate, and it is not at all the norm as you can see for yourself driving up the 5 Freeway. In a nation that gorges on meat, we will have no meaningful change if we shake our fists at carnivores. Instead, let’s work together to demand transparency in our country’s agriculture and expose it’s rampant abuse. Veggie Libel Laws, which vary from state to state, actually prevent anyone from making disparaging comments against Big Ag food producers. 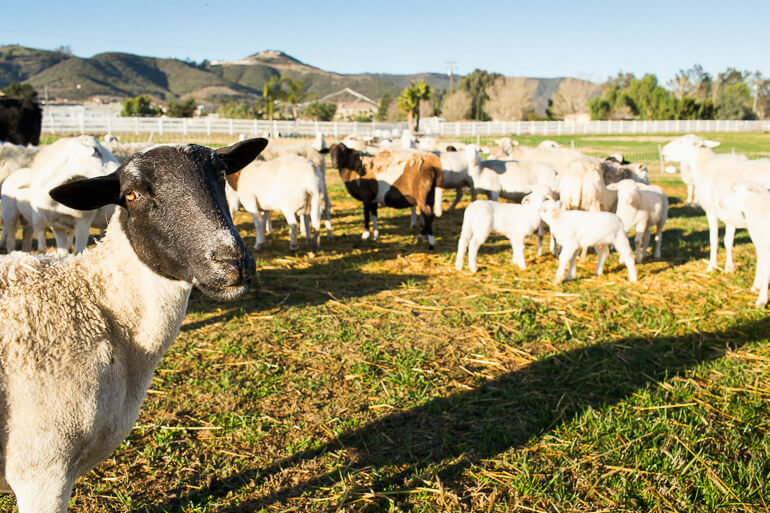 On the flip side, Primal Pastures, as well as many other small farms in California, have open farm days and encourage you to talk about what they do. So take the kids or grab a date and go visit a local farm. We’ve allowed ourselves to become so disconnected and ignorant about our food. It’s up to each one of us to change the course of our broken food system as we vote with our fork every single day. Be educated about misleading food labels like “grass-fed” where livestock is allowed to be on feedlots until “finished” on grass the last month before slaughter. It’s essentially cheating and contributing to a pastoral fantasy that our powerful Big Agriculture industry needs us to believe in. Remember when Oprah spoke out against the beef industry, and then got sued for it? Big Ag does not want us to question their practices because they have a lot to hide. Let’s eat less meat, and be mindful of the meat and dairy products we do purchase. Grow a garden, even a small one, and cook a meal. Support the food makers who purchase their ingredients with consciousness and can name all the farms they work with. Let’s change our food system with each meal.